The above picture is based on a crochet pattern called Sophie’s Universe. The mandala universe, like a kaleidoscope, continues to unfold in beautiful dynamic fashion. The eye is drawn from the center to the encompassing spheres and back to the center. The pattern evokes, for me, a consciousness of the cosmic universe, which I will try to explain. For some time now I have been contemplating the Light of Christ , what it is, how it works, and its communications with the Holy Ghost. Several years ago I gave a talk in Sacrament Meeting and compared the Light of Christ to a magnet within each of us. The Holy Ghost was a matching magnet external to us. The Light of Christ and the Holy Ghost communicate with each other through spiritual magnetism/energy. When we accumulate too many layers of ego or distractions or sin, the magnetic signal becomes weak and we do not feel the influence of the Holy Ghost. When our Light of Christ is in sync with the Holy Ghost we can feel the heat from the magnets’ interaction. It was an interesting visual to aid my thinking. 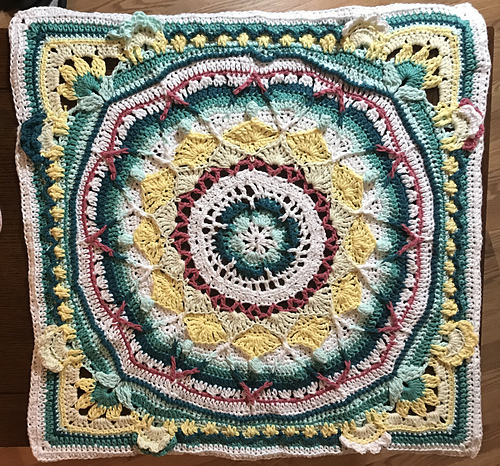 However, since seeing my sister’s crochet mandala, I imagine the Light of Christ (or substitute power, priesthood, energy, life force, God’s Love) as a tranquil body of water. A thin, weightless, beautiful veil lays on the surface, with small openings through which the water can rise and form bubbles symbolizing human beings and all organized things including animal and plant life. The bubbles contain the same fluid as below the veil, communicating with the large body of water; rising and receding into the whole from which it came. In this visual, the Light of Christ is permeating all things, and is essential for life. 7 Which truth shineth. This the light of Christ. As also he is in the sun, and the light of the sun, and the power thereof by which it was made. 10 And the earth also, and the power thereof…. We say God is omnipresent, omniscient and omnipotent. It makes sense to me that if God, through the Light of Christ, is present in the immensity of space, in every life form, in every cosmic realm, then this is the mechanism or channel wherein God is aware of all things at the same time. God can be everywhere because the Light of Christ is emanating from God and reaches all places where there is light and life and order. The Light of Christ is what takes chaos (unorganized matter) and organizes it. Women are also associated with chaos because women are able, through their physical bodies and the Light of Christ within them, to take unorganized matter and bring forth organized life. I find this beautiful. I also find it amazing contemplating being intimately connected to God and all other things through the Light of Christ. It is the essence of God dwelling within me; giving me life, light and order. Maureen enjoys time with her family, especially her grandchildren. She enjoys knitting, swimming, walking, talking and contemplating. August Young Women Lesson: How can I prepare now to become a righteous wife and mother? I like the image of a pilot light ranging from a dim flame to roaring fire, or a waterway channel ranging from a babbling brook to the Amazon River. Also been thinking about the Initiatory Ordinances and how the ordinance is administered by one person (Light of Christ = truth and knowledge of right and wrong, truth and error); and then the ordinance is sealed or confirmed by a witness (representing the Holy Ghost). My ideas not doctrine; just thinking…. The Light of Christ is so interesting. The gifts of the spirit…the attributes of Christ are given us via this channel. The Holy Ghost communicates via the Light of Christ (per Pres Packer). When we take the Sacrament we are asking to have His Spirit (Jesus Christ’s spirit) with us always. It is always with us, always within us, but to a lesser or fuller extent. I believe there is a Fullness of the Spirit and that is what we are asking for during the Sacrament but we may not realize that. This is how I think/pray about it now.